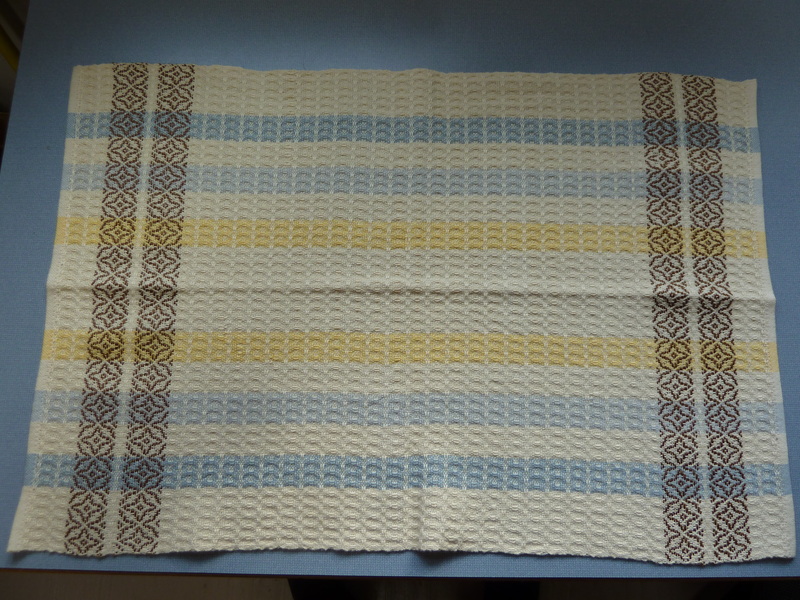 Last week I finished the next 3 towels after fixing the warp on my loom at the weaving guild room. 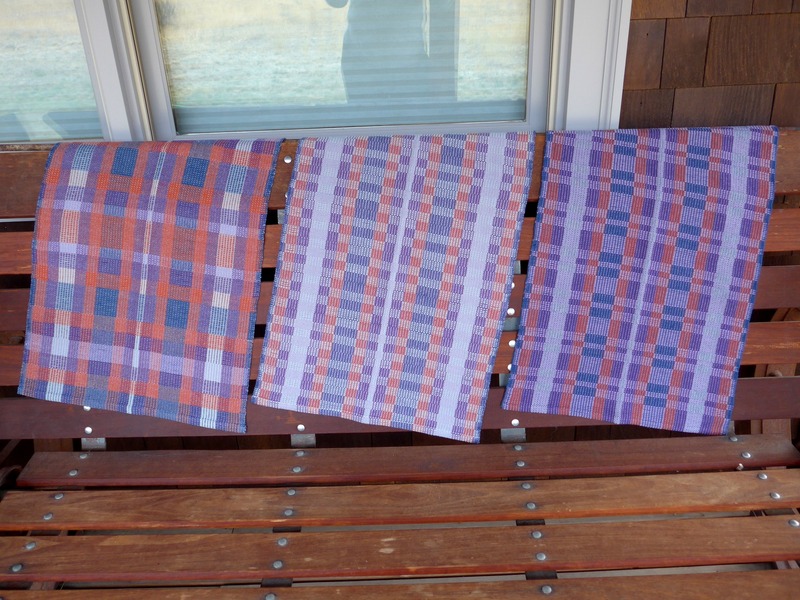 There are 3 different treadlings given with the pattern instructions so this represents all of them. 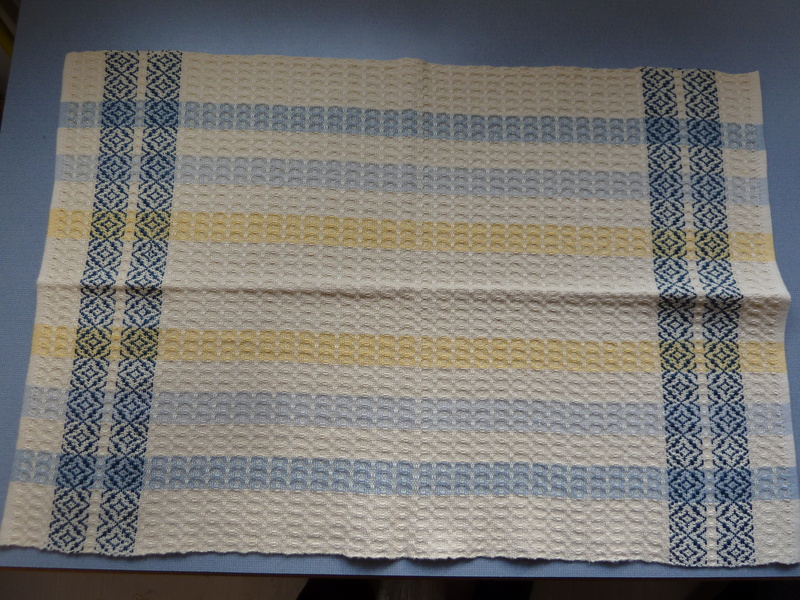 Here is a closer look at the one that was offset by one thread (on the left) compared to the correct version (on the right). I have been down at the guild room a lot this past week, weaving more of these and using different color combinations for the wefts – so all of them will be a little different. Should be able to finish up today and then, of course, there is the hemming and washing and pressing to do – but I should have more pictures coming up. Last night there was a really fun event down at TwispWorks. 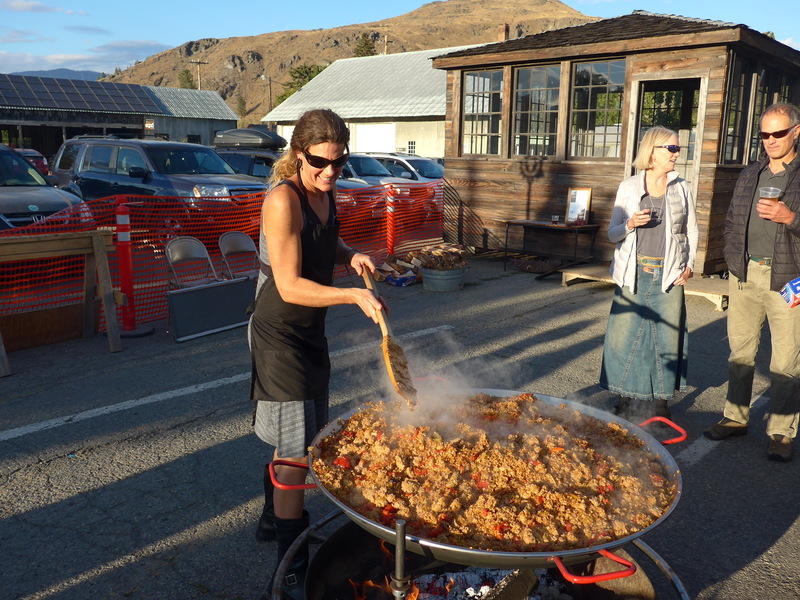 Bluebird Grain Farms had its 10th anniversary celebration and organized a Farm to Table Paella Feast featuring paella made with their emmer farro as the main dish. There were about 300 people in attendance! The paella dinner was designed by Cameron Green (she is a local chef and caterer). 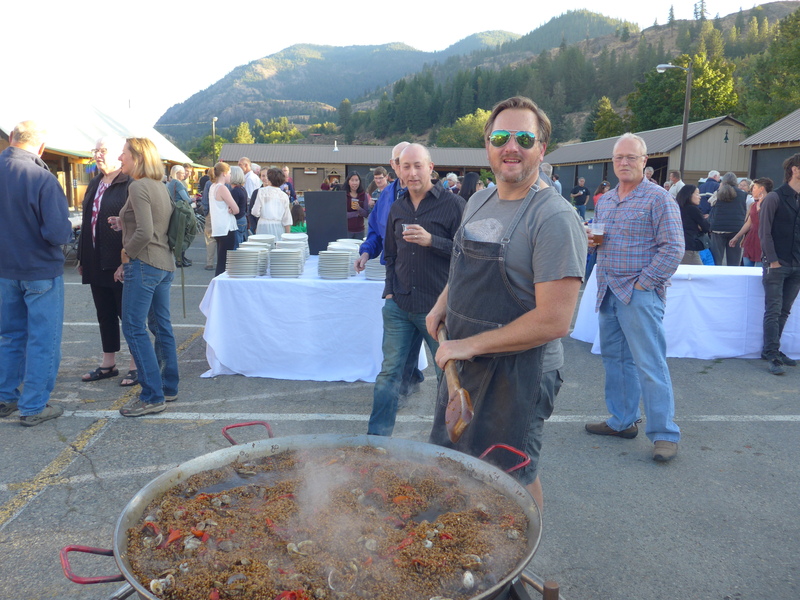 John Sundstrom of Lark restaurant in Seattle, one of Bluebird Grain Farms’ earliest customers, came over for the event and prepared his signature seafood paella dish. 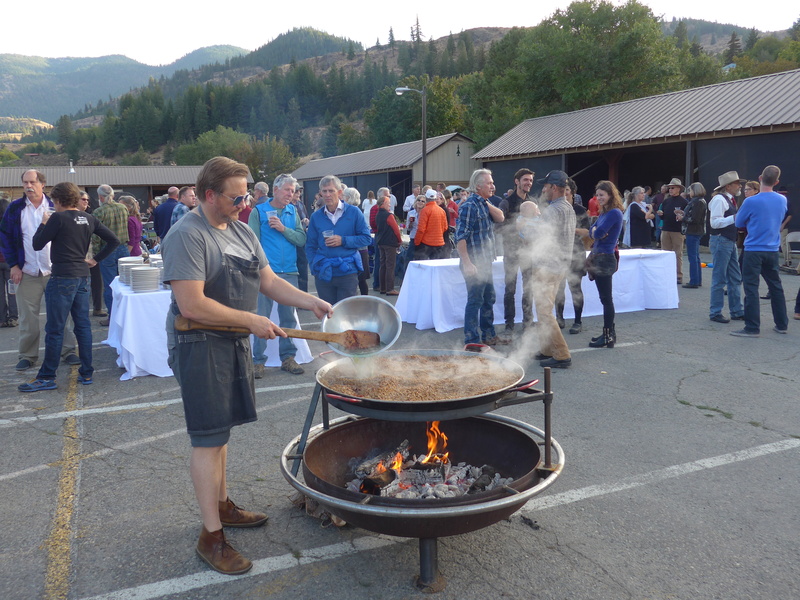 There were three huge paella pans going over wood fired outdoor cookers, plus several salads, bread, desserts, and a no-host bar featuring local beer and wine. Almost all of the food was sourced from local farmers, bakeries, coffee roasters, etc. 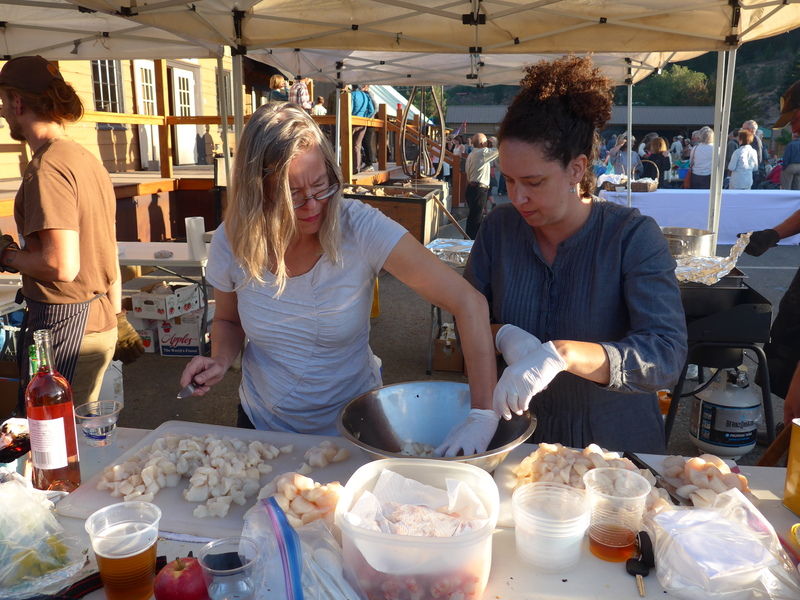 and some of the proceeds went to support the Methow Made program (in 2013, TwispWorks started Methow Made as a collaborative marketing program to help Methow Valley food and beverage producers reach new customers). 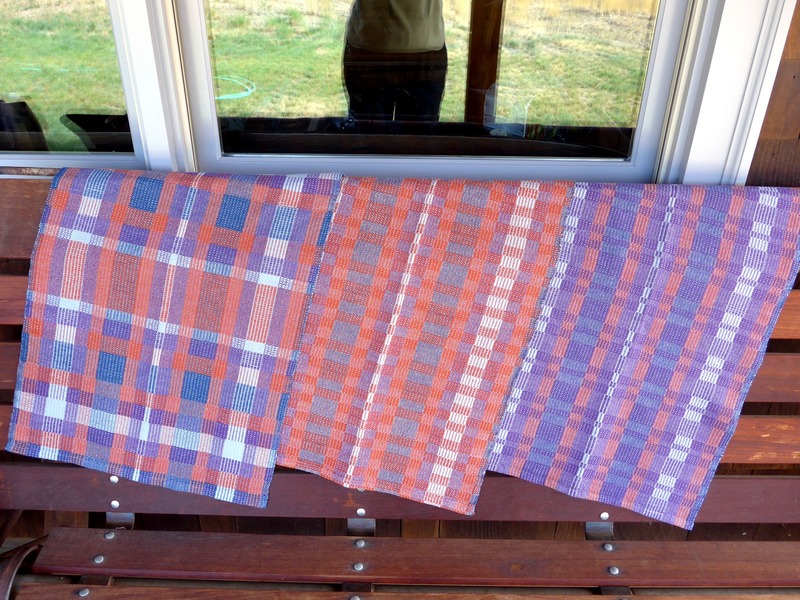 Before I go into the weaving saga, let me just say that things have calmed down considerably here at our home since my last post. 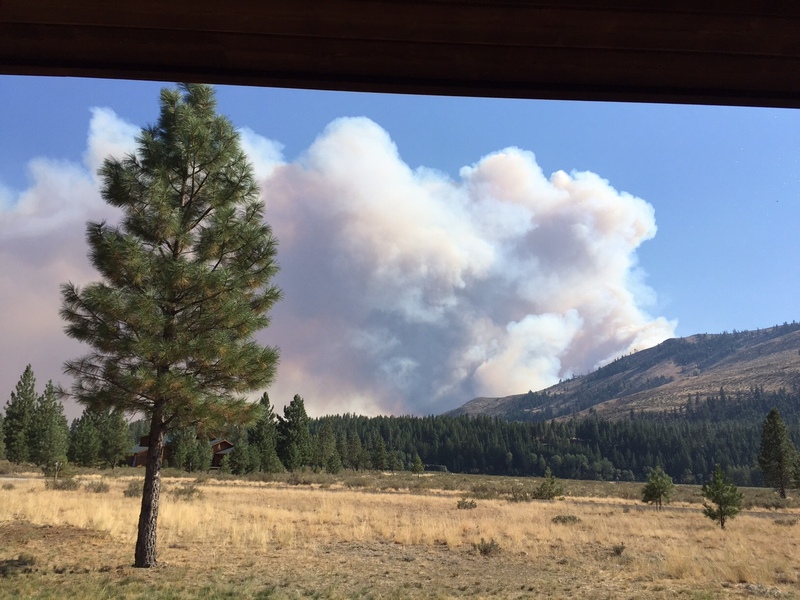 There was an article on regional fire activity yesterday (Saturday August 29) on Methow Valley News Online if you want more information. 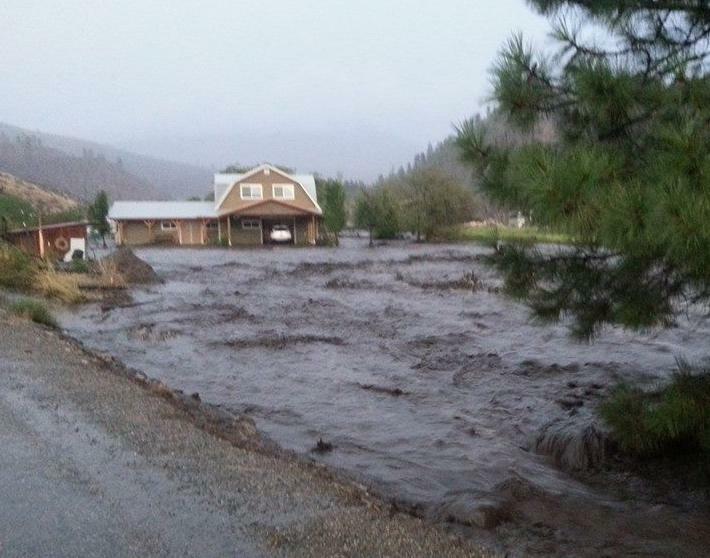 There is still some bad stuff going on in the lower Methow Valley, over in the Okanogan Valley, and around Lake Chelan. It was terribly smoky here this past week and we had to stay inside as much as possible and not leave any windows open. But our area is back to level 1 “be alert” and we have moved back in and brought the Airstream home. We had some rain and wind yesterday and the air this morning is lovely and clear. 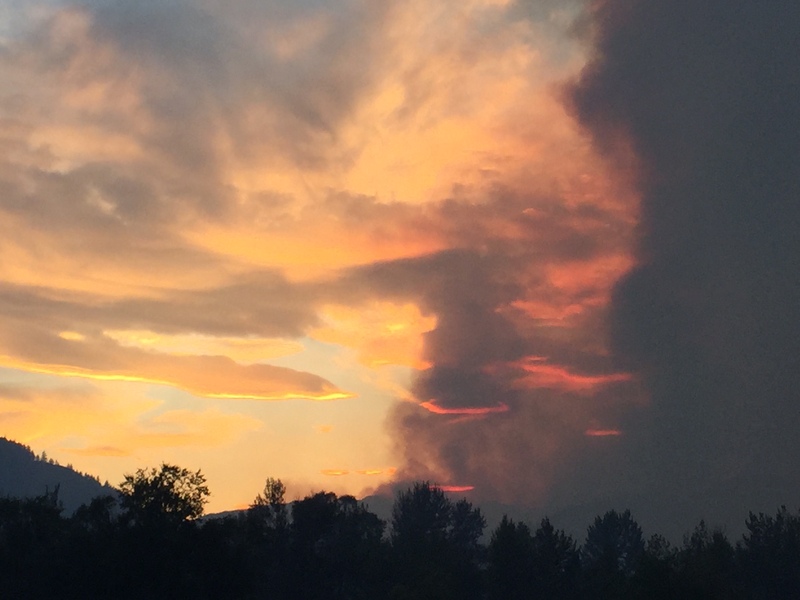 They are hoping to open the North Cascades Highway today, although there may be occasional closures due to mud and rock slides, continuing fire fighting efforts, etc. 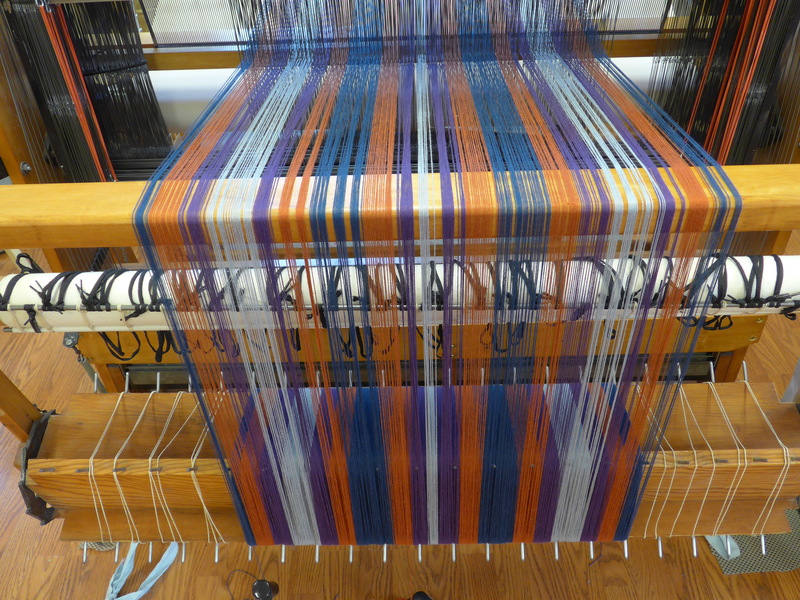 This past week I have been down at our weaving guild room putting a towel warp on the loom I keep there. 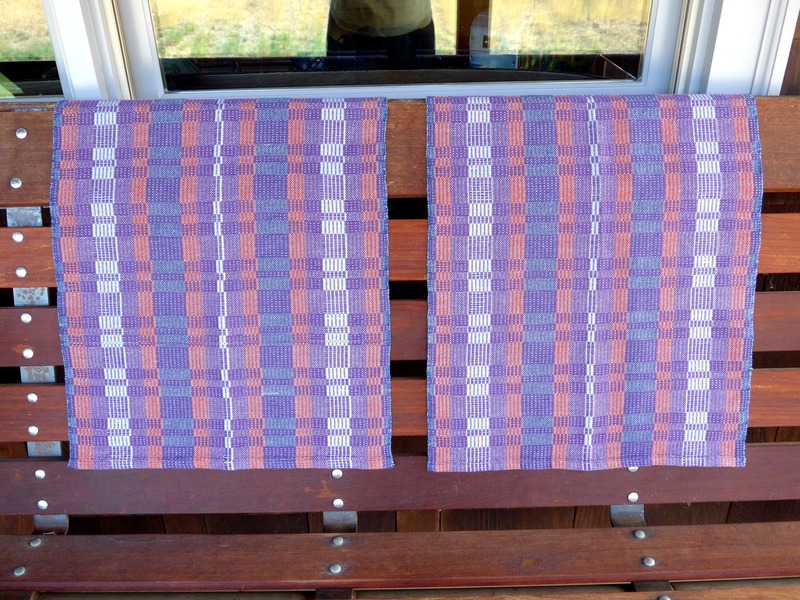 It is a project from a 1994 Handwoven magazine called Country Rustic Towels. 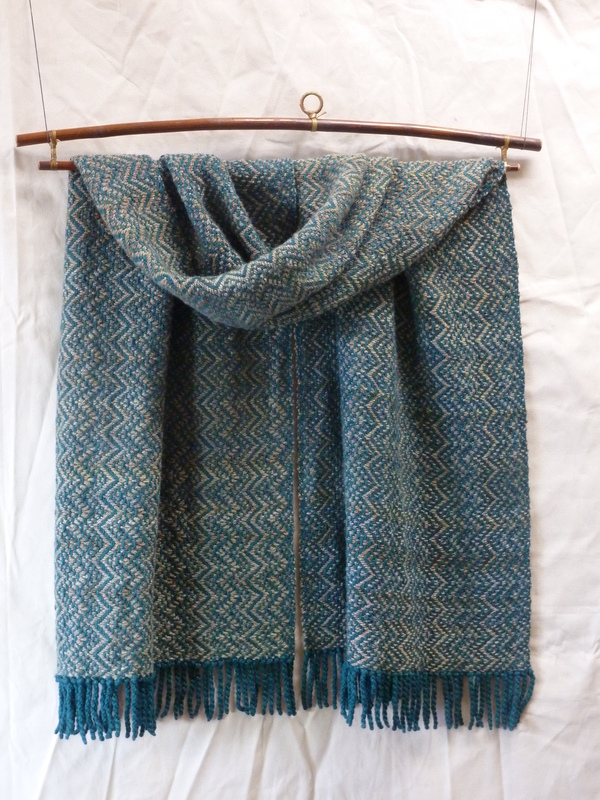 This was re-published by Interweave Press in “Best of Handwoven – A Dozen Projects in 8/2 Cotton” which I purchased as an eBook (PDF download) back in 2012. So that was the source I was using to set up my project. It is a Crackle Weave structure, which is something I have not done before. There are 4 blocks or units and each color stripe is a different block, with what is called an “incidental” or transition warp end between blocks. I brought my AVL warping wheel down there and wound a 12-yard warp onto the sectional beam. 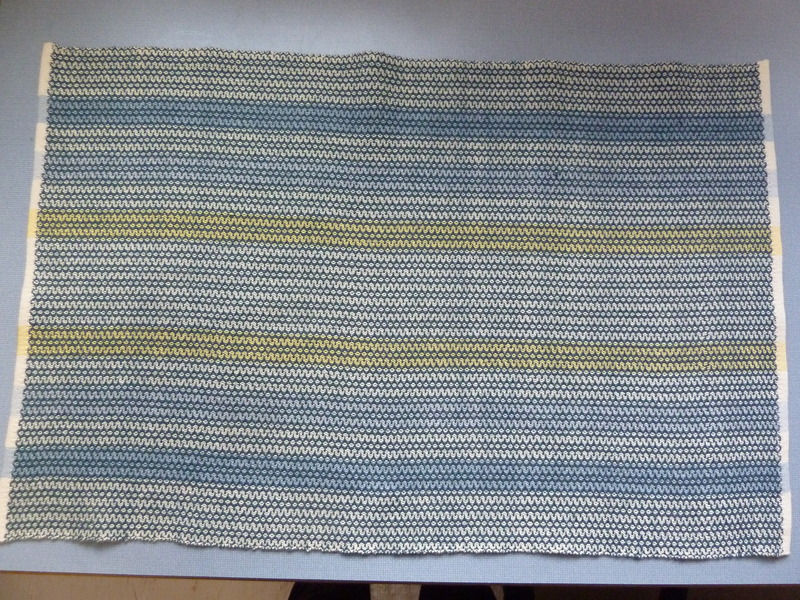 Threaded it, sleyed the reed, tied it up and started weaving the first towel yesterday morning. 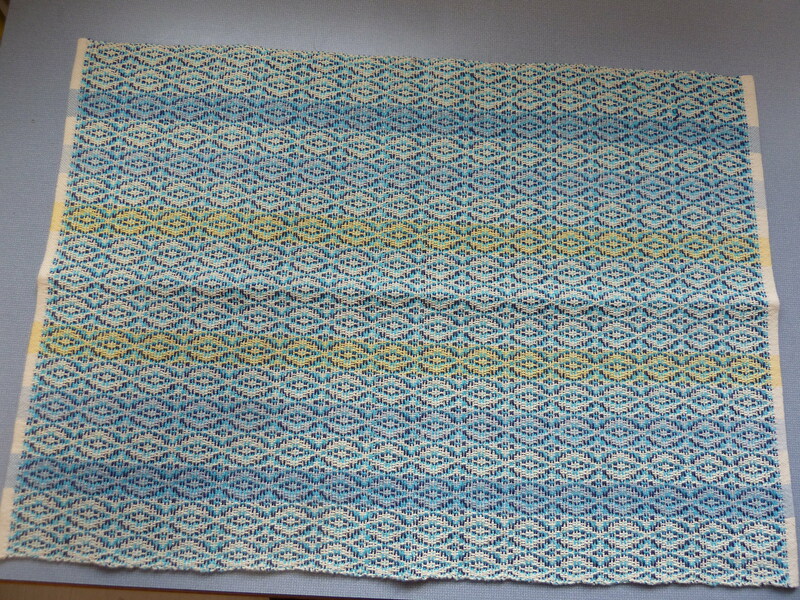 The pattern is shifted by one thread! I went over and over what I had done, and yes, it matched the published instructions perfectly. 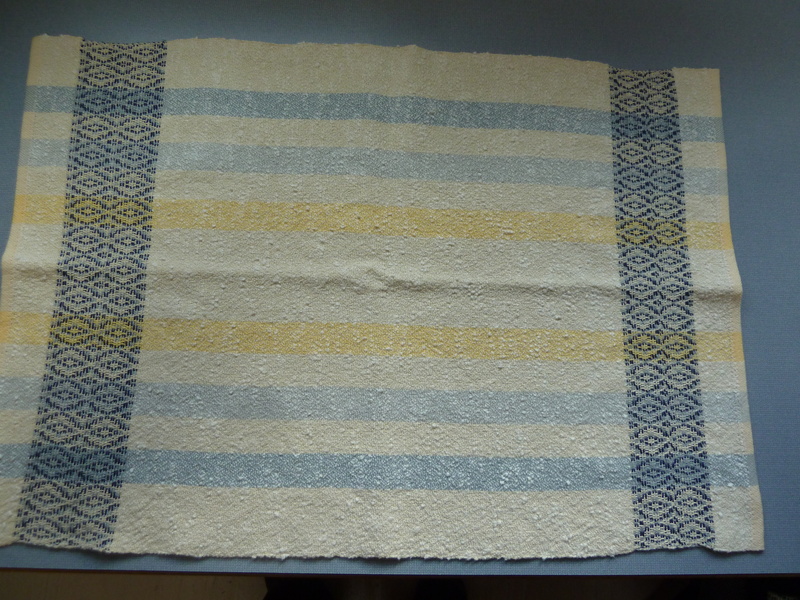 Then I went to our guild library shelves and got out the original Jan/Feb 1994 Handwoven magazine. It turns out they edited the original pattern and did indeed add some useful information. 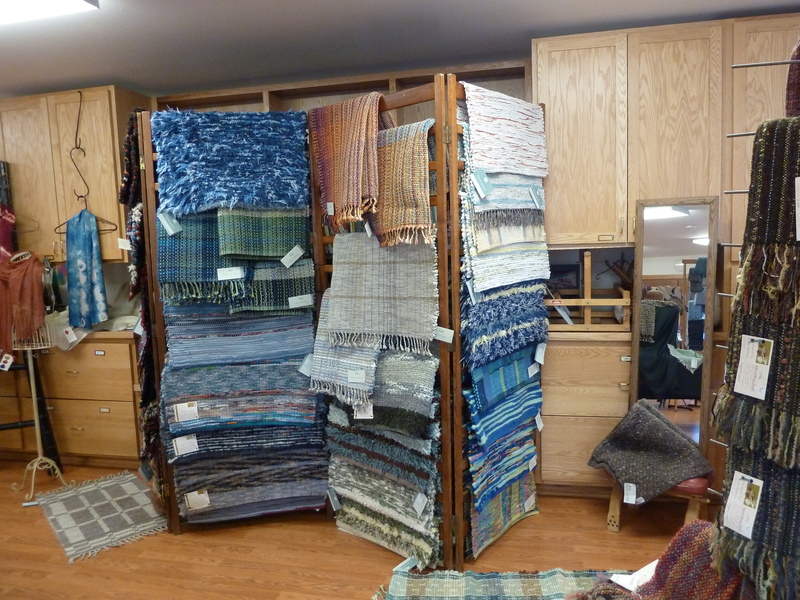 But they got one thing backwards – the warp color order chart! Actually it is just a little thing – it should start with 13 blue threads on the right, and end with 12 blue threads on the left, not the other way around. 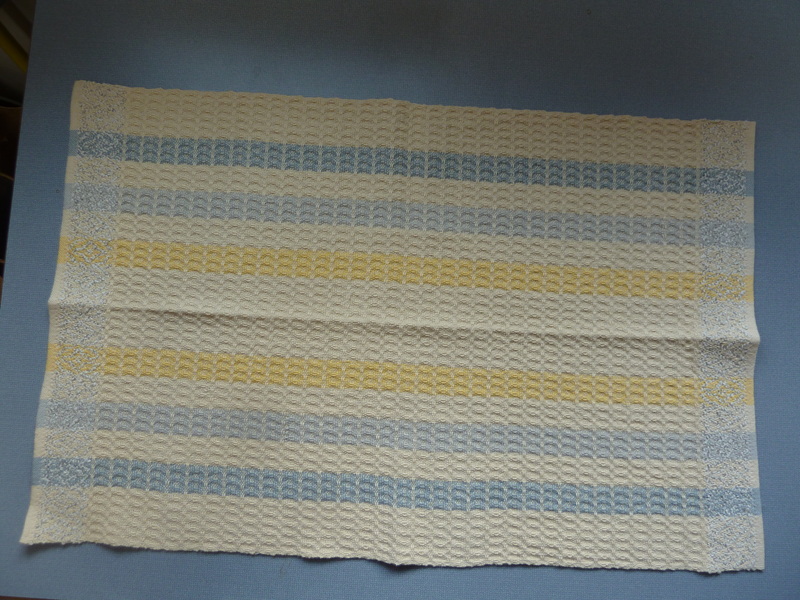 It is correct in the original instructions, but not in the Dozen Projects in 8/2 Cotton book. 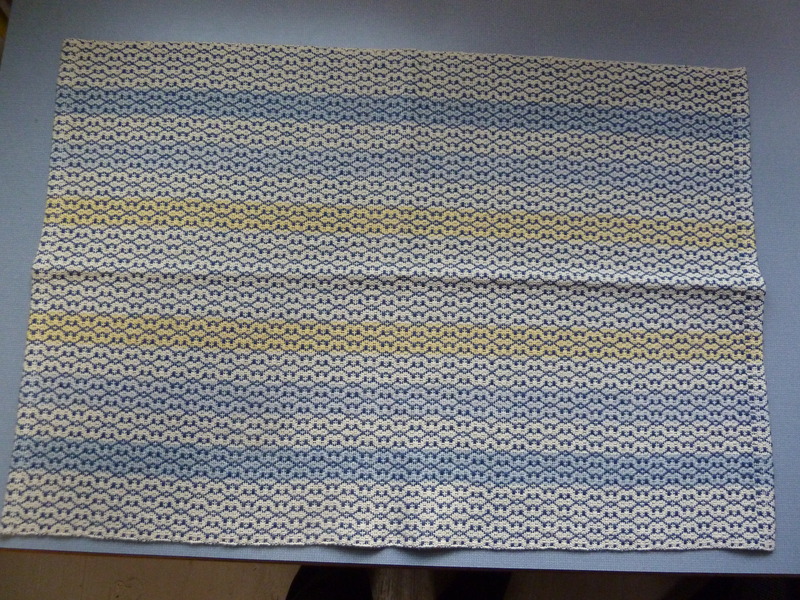 I consulted with another guild member, and we agreed it is most obvious in the light gray stripes. 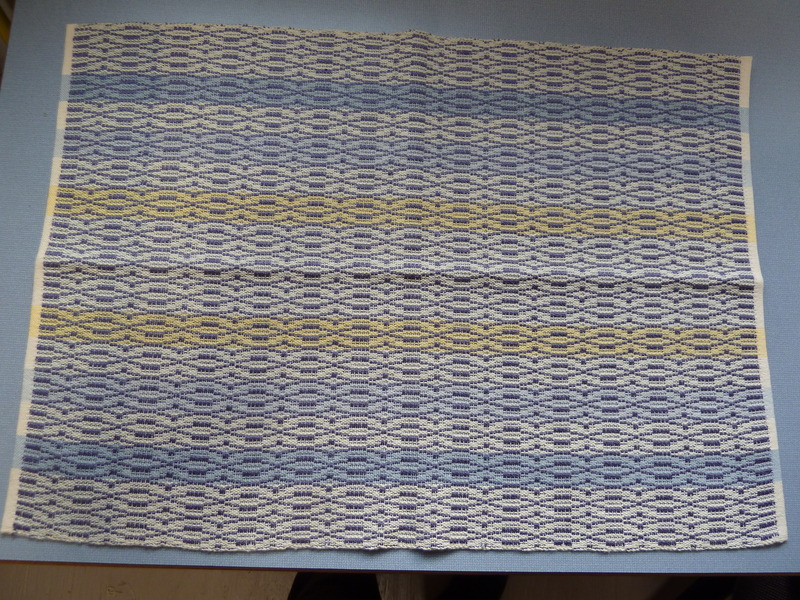 She suggested that I finish the first towel, then selectively replace some of the warp threads on either side of the gray stripes to at least improve the appearance (I have 10 towels to go, mind you). That would mean having extra weighted threads hanging off the back for the rest of the weaving. When I left last night, that was my plan. But at 3:30 this morning, during an awake period, I decided to bite the bullet and re-thread the darn thing. That will fix all of the blocks, not just make the gray ones look better. And it won’t be as hard as the original threading, as I already know it is threaded correctly. I will have to remove the left-most blue thread, then go through from left to right moving all the rest of the threads over one heddle. 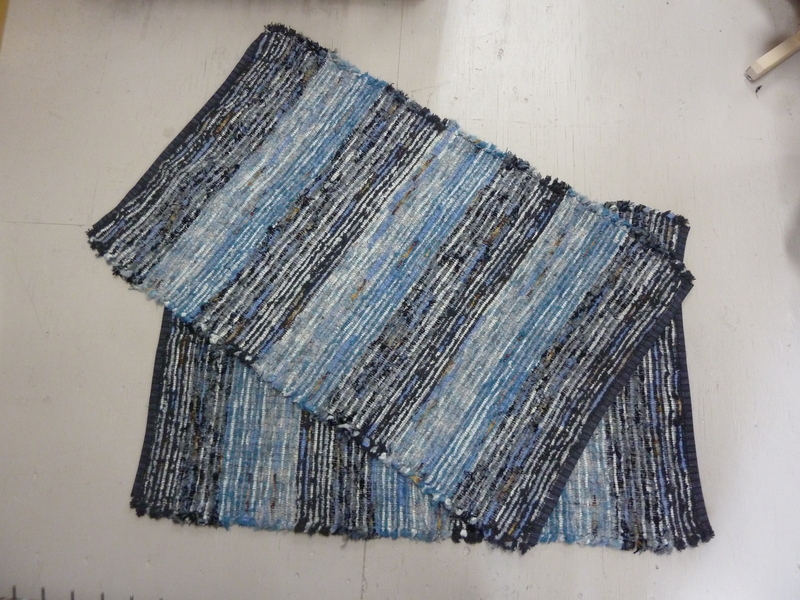 Then add one new blue thread on the right. 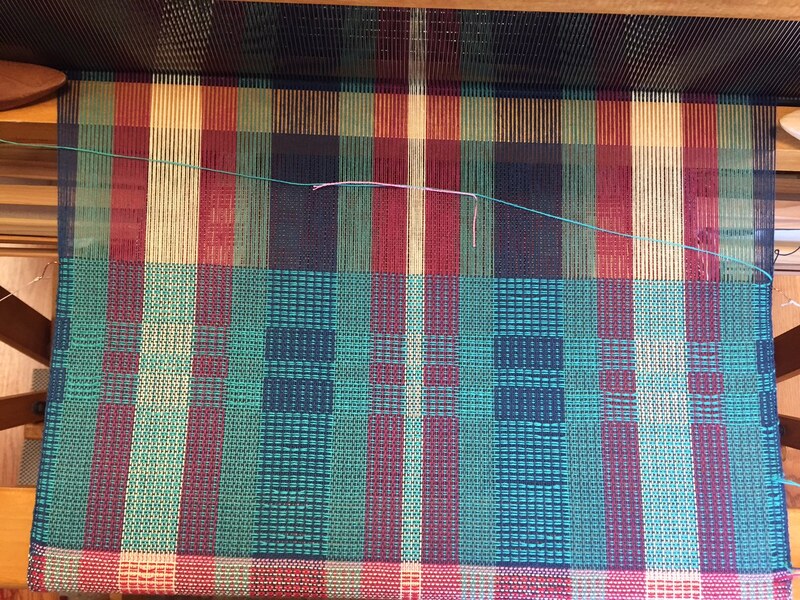 If only I knew more about crackle weave, I would have realized when I started threading the heddles that the transition threads were the wrong color. That would have been the chance to remove the left-most thread and add one at the right, before I started threading. But no, I was being a “blind follower”. Live and learn! We just went through a big fire event and I thought I would post a few pictures. 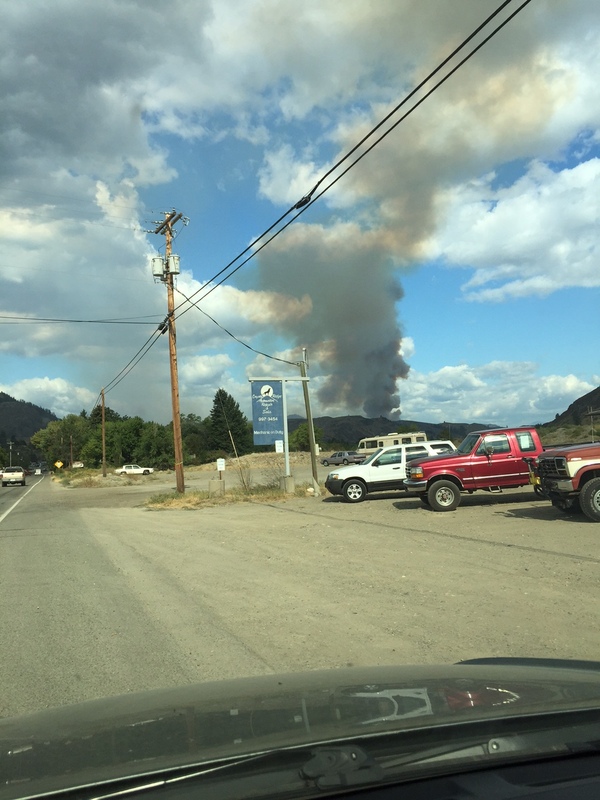 It was a fire up the Twisp River Road that started last Wednesday (August 19) and just blew up in a matter of hours. Both Twisp and Winthrop were put on level 3 evacuation (which means “get out now”). Some folks have asked how we knew about the evacuation level. After some neighbors came around and told us we should start preparing to leave, we started to listen to our local radio station KTRT. Then we got an automated call on the home phone from Okanogan County Emergency Management with the evacuation notice. Later, around 6 pm, a state patrol car came around the neighborhood. By then, we had most of our things out in the car, pickup truck and cargo trailer. We wound up staying 2 nights with friends about 6 miles south of Twisp. Things were just as bad or worse over the hill in the Okanogan Valley, by the way. A lot of this was on the national news. Three firefighters died and another one was terribly burned last Wednesday when the fire first broke out – that is the worst part of this whole thing. On Friday they seemed to have things under control near Twisp so we decided to head back home but leave our things packed up in the vehicles for the time being. 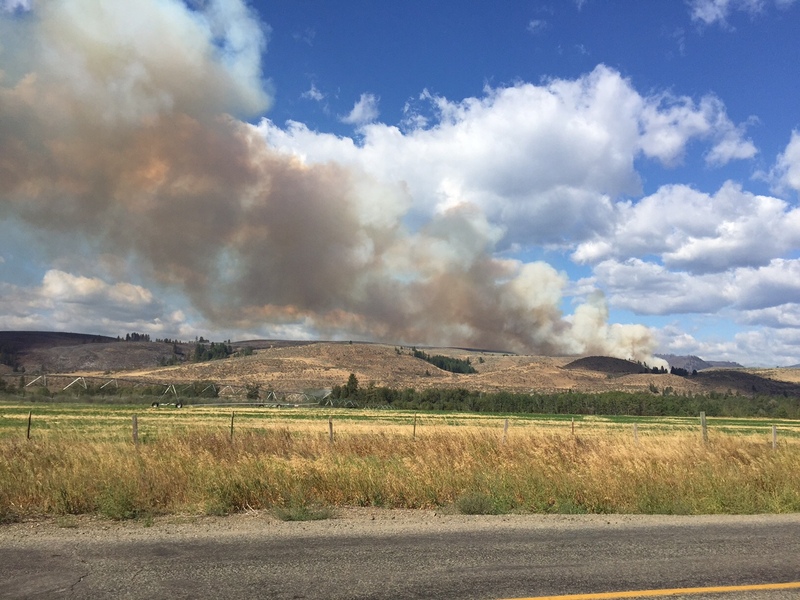 There was still fairly active fire in a wildlife management area north of Twisp River Road, and Friday afternoon they started up with the DC-10 fire retardant planes and water bucket helicopters. That seemed to knock it down quite a bit but they are still working on containing that end of the fire as I write. 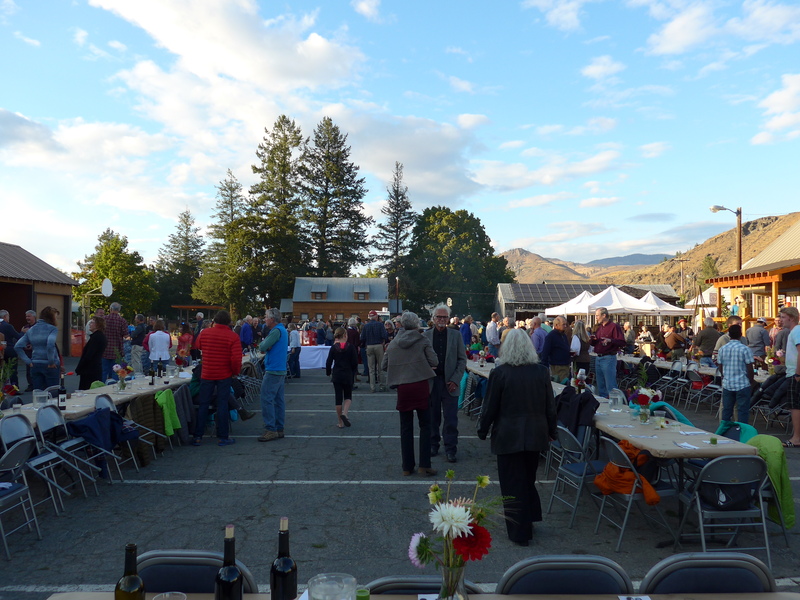 There was a good update on Methow Valley News Online yesterday (Sunday, August 23). 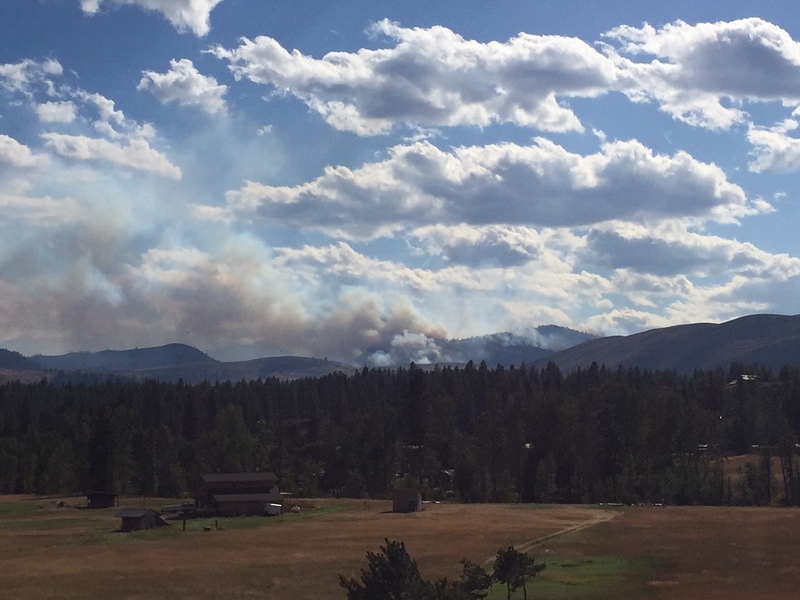 The Twisp River Road fire is just part of the bigger Okanogan Complex and is being managed by a Type 1 Incident Team as part of that bigger complex. 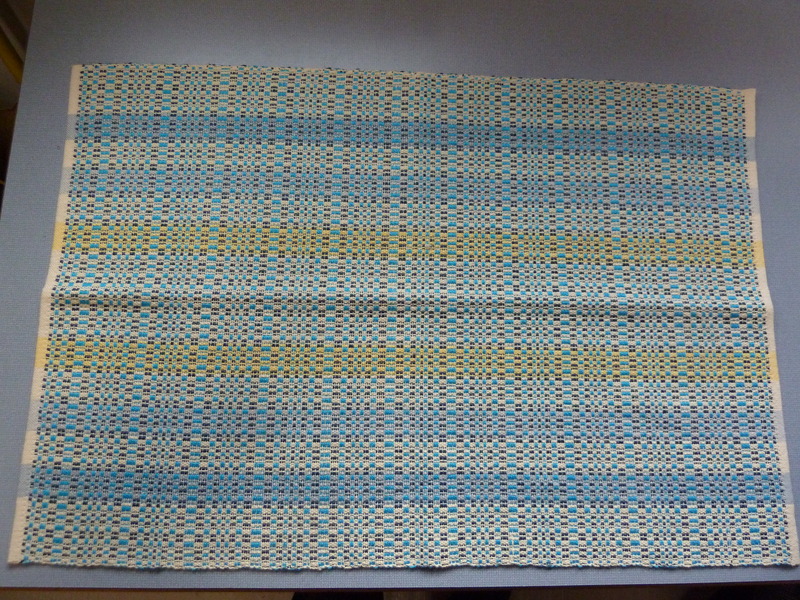 We are mostly moved back in now and I actually got to spend some time weaving yesterday. We know we are very fortunate compared to what some other folks have been through this past week. 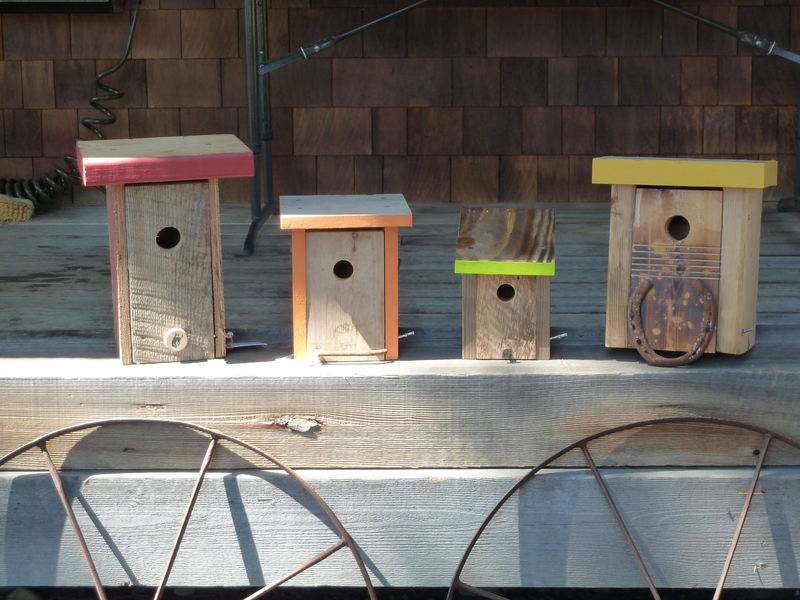 Earlier this week, a friend came by who has started a business making Nice Nests, “breeding boxes made from salvaged scrap wood and reclaimed hardware, designed specifically to provide functional breeding habitat for cavity-nesting birds. He also offers installation and consultation services for landowners interested in enhancing breeding habitat for more than three dozen species of cavity nesters in the Methow Valley.” The quote is from a recent article about him in the Methow Valley News. Rick had quite a bit of pine soffit material to give him (left over from building our house), and also a big box of miscellaneous hardware, some of it old. Patrick was really excited about the hardware – he uses “found objects” and cool old stuff for perches and handles. Yesterday morning he came by with 4 Nice Nests for us! They will go up on pine trees around the house next week, and hopefully we will get some bird families to move in. They all are easy to open up for cleanout, and he uses rough wood or scores the inside face of the doors so the little hatchlings can get a grip to climb out when it is time to leave the nest. The hole on the green one is 1-1/8″ and he said it would only be used by wrens, chickadees or pygmy nuthatches. The orange one has a 1-1/4″ hole and would be for red or white breasted nuthatches. The two bigger ones have 1-1/2″ holes and would attract western bluebirds and also tree or violet-green swallows (but these boxes are also the most flexible, as some of the smaller birds could use these too). Now we are going to have to get out the bird book and binoculars and learn to recognize these species! Here is Nice Nests on Facebook and also his Nice Nests website (very well done, by the way). My Dad rather pointedly reminded me that I haven’t posted since the one titled “A Month Went By” – and that was over a month ago. Well, it’s not like I haven’t been doing anything. 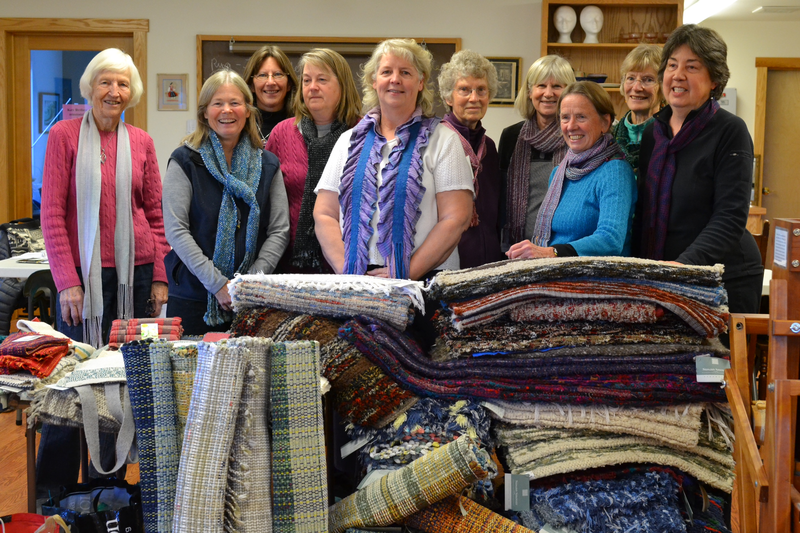 The end of October brought the Seattle Weavers’ Guild sale. I didn’t go over for it this year, but did send my handspun wraps and some Mosaic Mojo hats over to a friend to take in for me. 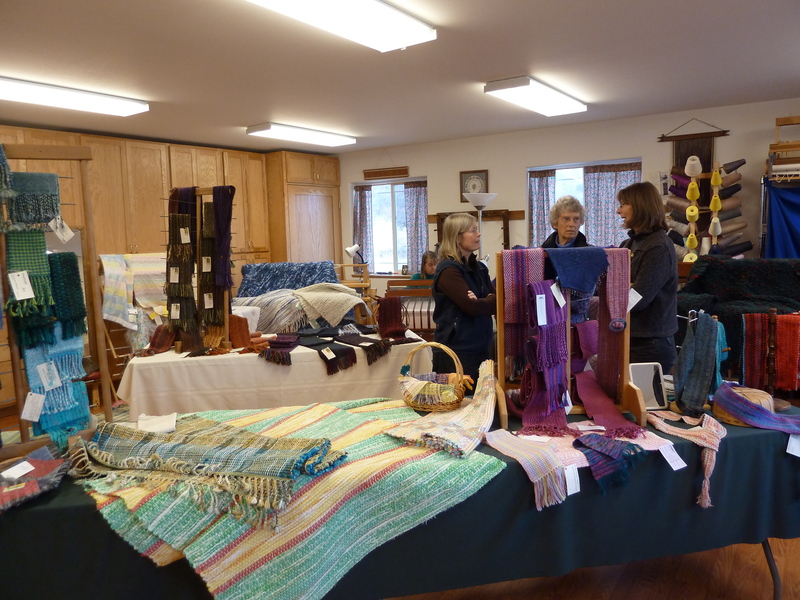 I sold 4 hats but nothing else – my friend brought what remained out to me at an annual knitting retreat I have been attending for decades. That was a lot of fun, as always – 4 days of hanging out with old friends, knitting (and going out for some nice dinners in Port Townsend). There is always a de-stashing sale and I once again pared down my knitting yarn collection – although it is still SABLE (stash acquired beyond life expectancy). 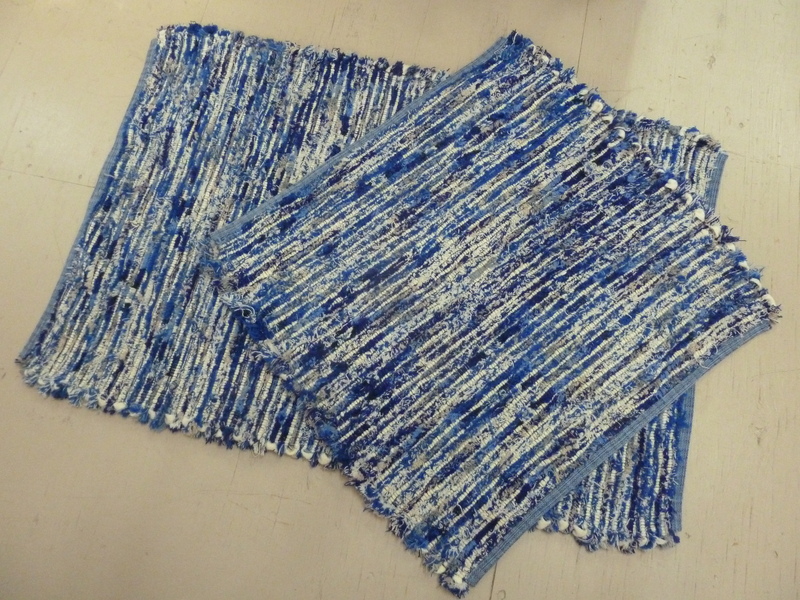 I also sold three of my handspun wraps! To say I was thrilled doesn’t quite cover it. Gone, but not forgotten. 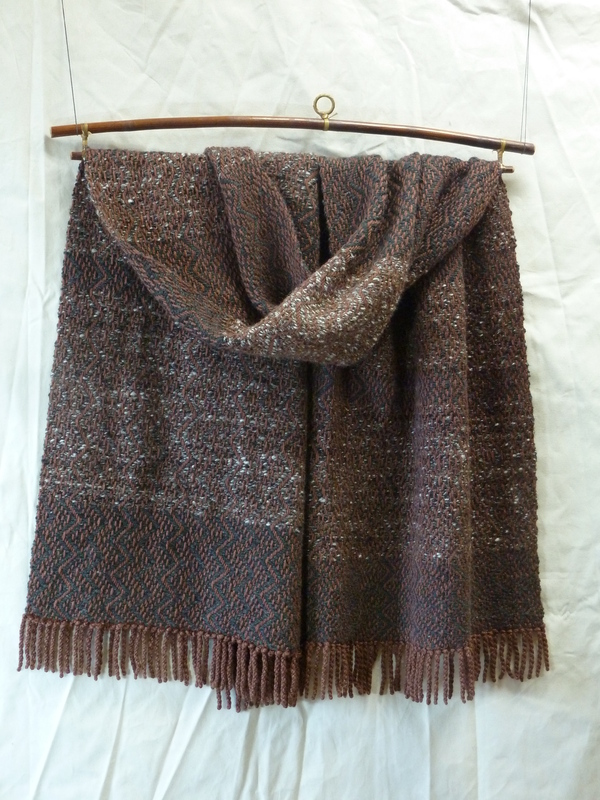 Of the 9 shawls I made in the late spring with my handspun, I now only have 3 left. Considering I wasn’t sure I would sell ANY of them, I am quite pleased! Right after I got home, we went down to Wenatchee for Rick’s knee replacement surgery on Nov 4th. That went very well and he is now about 3-1/2 weeks out and definitely on the road to recovery. 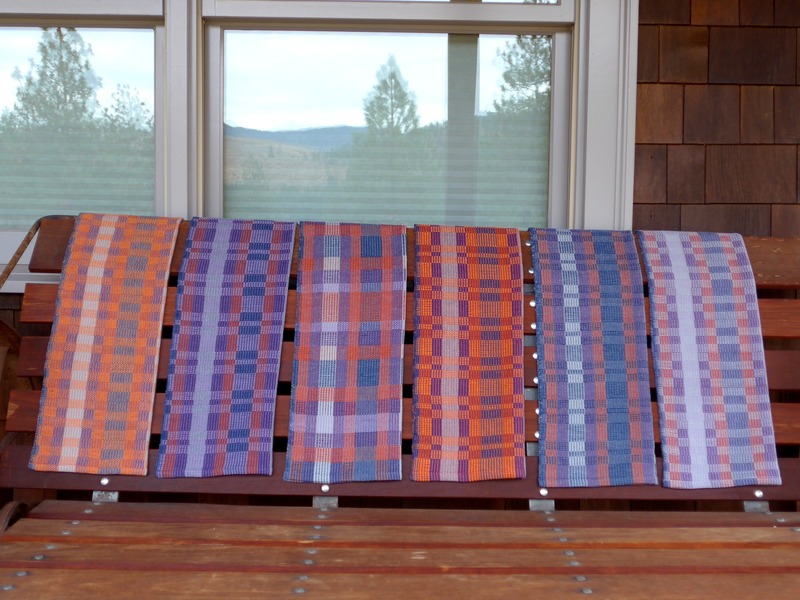 When we got back to the Methow, I went to work on finalizing the rugs I was making for the winter show at the Confluence Gallery in Twisp – the title of the show is “In A Land of Snow and Indigo”. Now, imagine a winter wonderland: the quiet of snow, shadows stretching across the horizon, cold, crisp air, and magnificent icicle stalactites. Peer from the warmth of your home through the windows or reflect on a day of snowy adventure – artists tell us what they see. 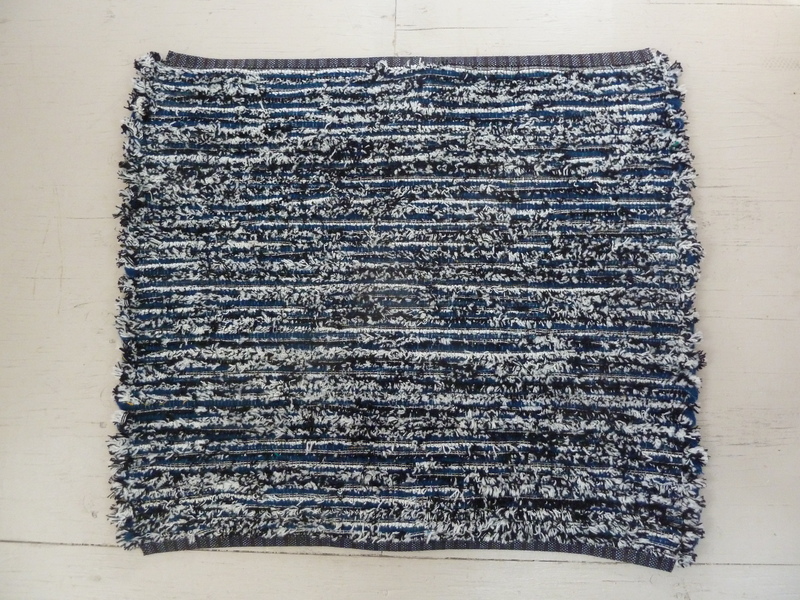 I made some rugs that I thought would would work color-wise – and there’s nothing like a cozy wool rug underfoot in the winter! Rick was actually up to attending the opening on Nov 15th, having moved off the walker and only using a cane at that point. He lasted for about half an hour before getting too uncomfortable to stand, but I think he enjoyed getting out of the house for the first time and visiting with folks. We also had a reporter for the Wenatchee World come by with a photographer and wound up with a story about our guild on the front page of that paper the week before the sale! The link no longer seems to be working, so you just have to trust me on this one. 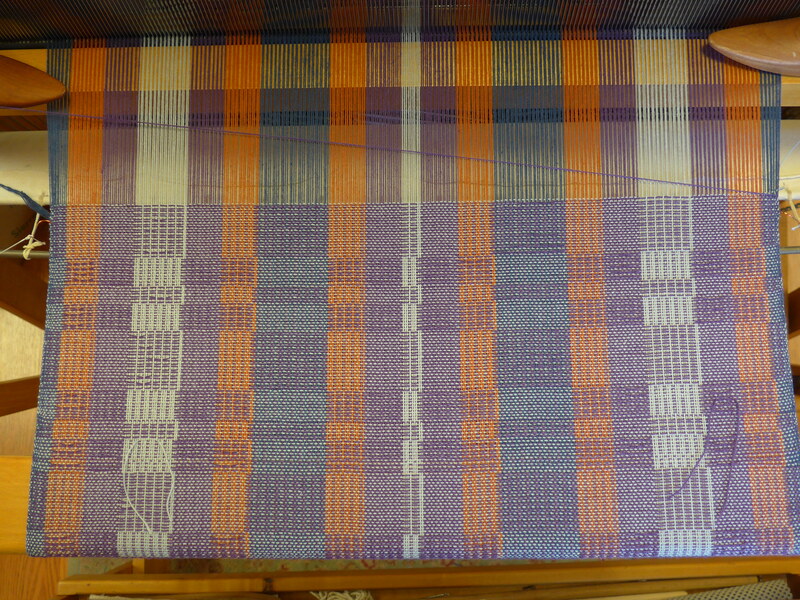 For several weeks before the sale, I wove 10 towels on my loom at the guild room, finishing off the warp I had put on for the Robyn Spady workshop in September. 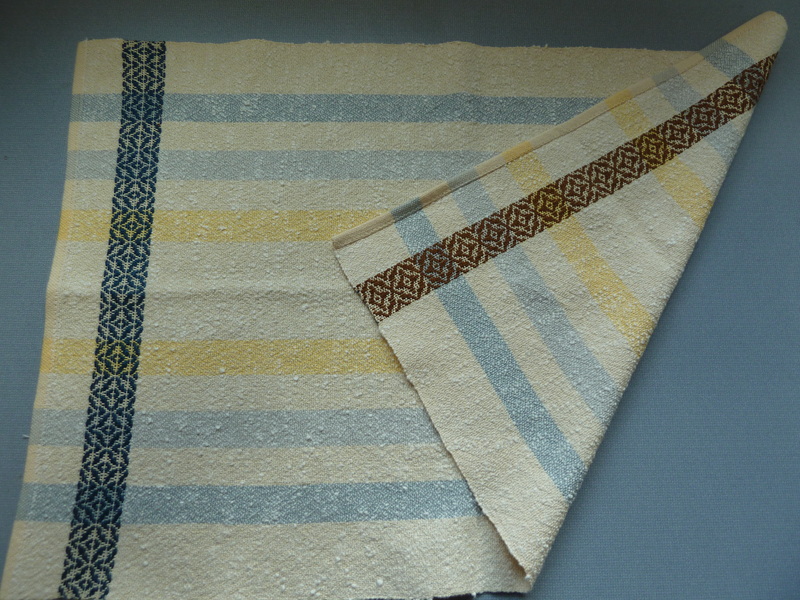 I tried quite a few of the treadlings/patterns we had covered in the class, so each one was different. My threading was for overshot, what we learned was how to get additional kinds of patterns by changing the tie-up and treadling. For the last 6 weeks or so, I have also been on a roll to make these “fiber beads”, which I am making into earrings for the holiday sales season. 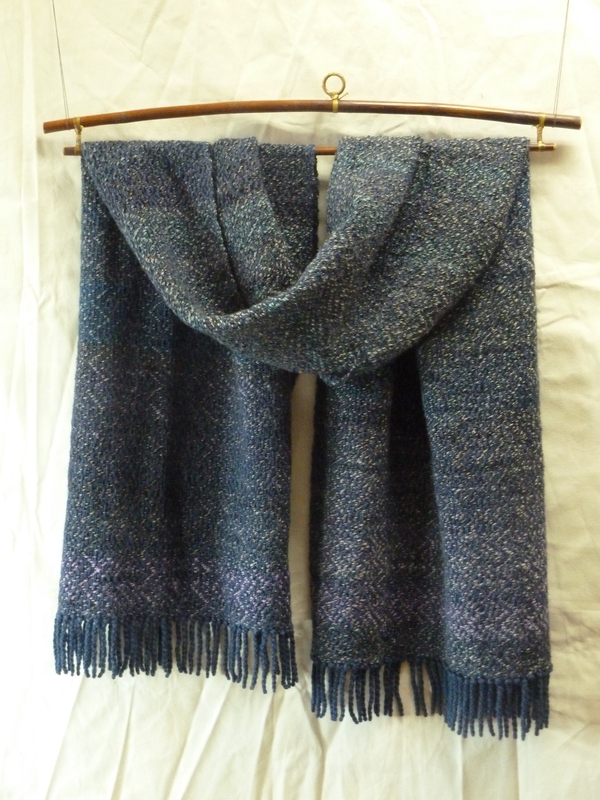 I did some up using my handspun yarn especially for the guild sale. These have been a lot of fun, and something I can do in the house in the evenings while hanging out with Rick and the cats (and the nice warm fire). 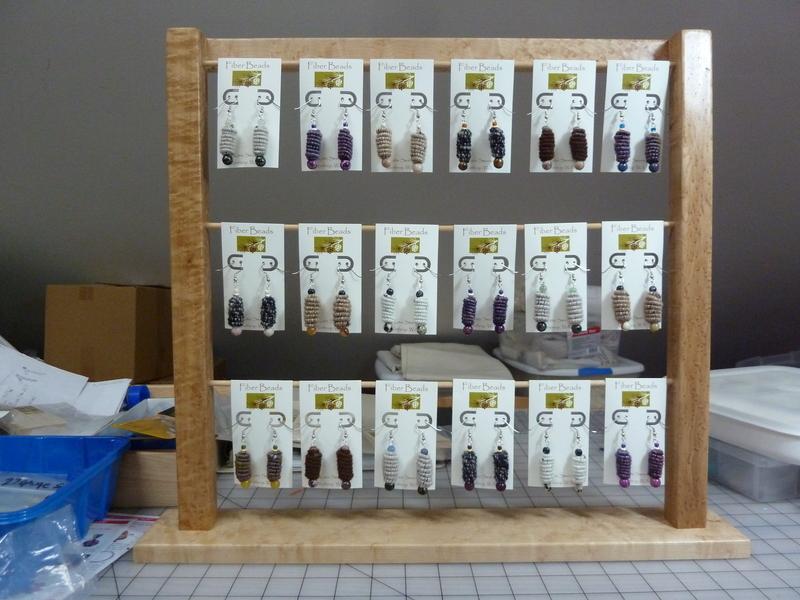 Rick made me the display racks a day or two before he went into knee surgery! 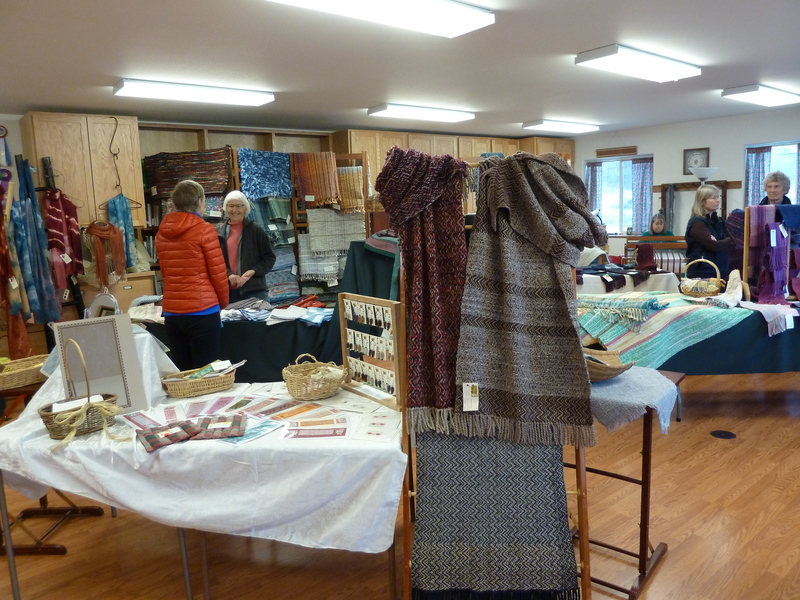 Well anyway, we had quite a good turnout for the guild sale, and I personally did very well – 17 towels (including all the new ones), 7 scarves, 5 rugs, 3 pairs of earrings. That’s the good news and the bad news! Now I have low inventory and commitments to Winthrop Gallery, Confluence Gallery and the holiday gift show coming up next week at Local 98856 in Twisp. 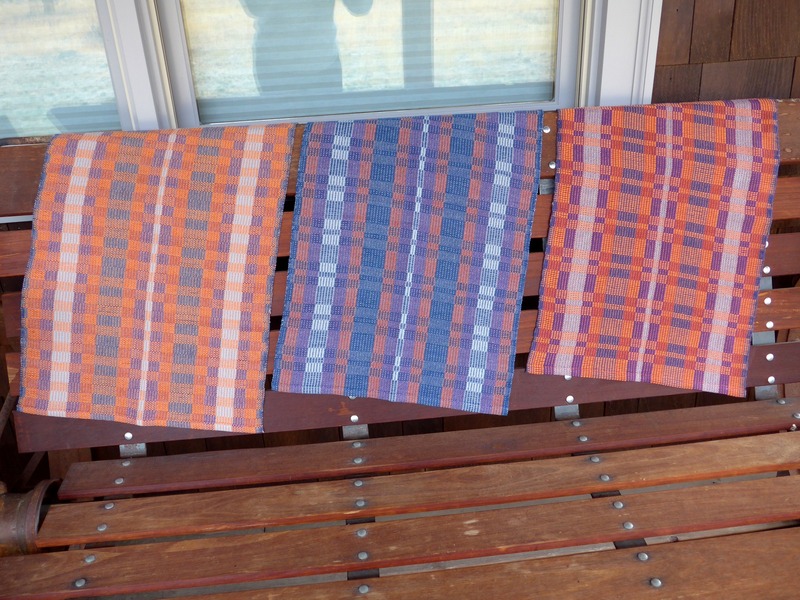 So now I am weaving more scarves. 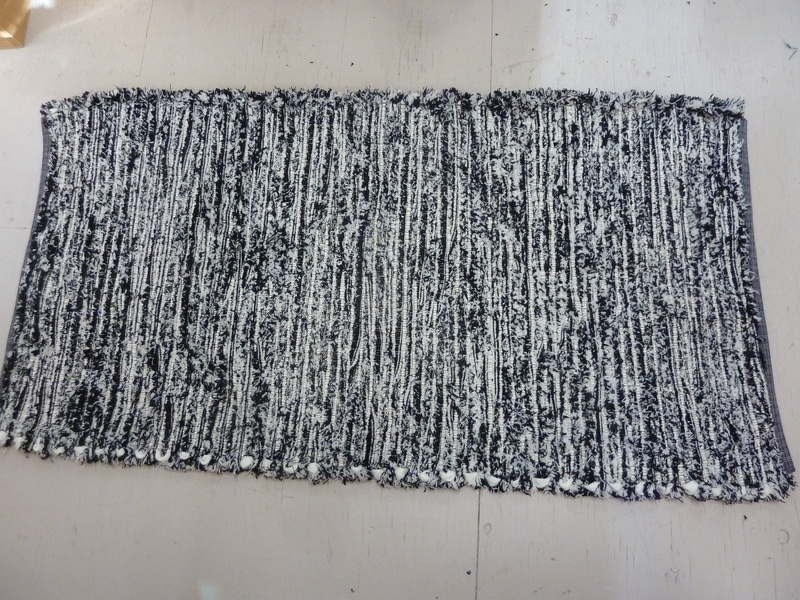 I have been meaning to post more pictures of my rugs, but hadn’t gotten to it. Maybe next week! For now, I am going to put up some information about the floods and mudslides – not to be grim, but because it’s an easy way for me to inform friends who might be concerned about “what’s going on over there?”. our former home at 102 Benson Creek Rd. We called the owners that morning, and the house was not actually flooded. But things were a lot worse up the road where our friends just barely saved their house from the fire a few weeks ago. I didn’t figure out until yesterday that it wasn’t just runoff from the sudden heavy rains, but that some of the dams in the Wenner Lakes up above them had breached. A huge torrent of water, mud and rocks came down and covered everything up there, and washed out the road. Heavy rains on Thursday (Aug. 22) collapsed two of four public and private dams holding water in the Wenner lakes on Benson Creek six miles southeast of Twisp, the Washington Department of Ecology reports. Personnel from the Okanogan County Department of Emergency Management are on the scene with dam inspectors from Ecology. The dams collapsed in one of the burn areas from this summer’s fires and a high volume of stormwater run-off may have caused the breaches. Thursday night a storm cell settled over the area which received about 2 inches of rain. The fires have scoured vegetation from ground that would have held back the stormwater and dead trees from the fires and debris from last night’s storm may have also clogged spillways raising waters levels beyond the dams’ capacity to hold it. The spillways normally should have been able to carry the stormwater downstream. The Okanogan County Sheriff’s Department is notifying downstream residents of the dam breaches and will advise residents if they should evacuate. The county’s Department of Emergency Management is evaluating the dams which have not breached to determine if water should be released from them to relieve pressure on the earthen structures. The Wenner lakes hold irrigation water and are used for recreation. The dams that collapsed were not due for inspection by Ecology this year and earlier this summer, Ecology’s Dam Safety Office advised owners of all dams in burn areas of Central Washington to inspect their structures for damage from the fires that would put their dams at risk of collapse. So the situation is that for now the 2 bigger lakes are holding but still being assessed. Our friends have evacuated with their animals. It is a total mess up there. Also affected were friends about 2 miles north of Carlton, where Leecher Creek comes down (off of burned areas up around Leecher Mountain). 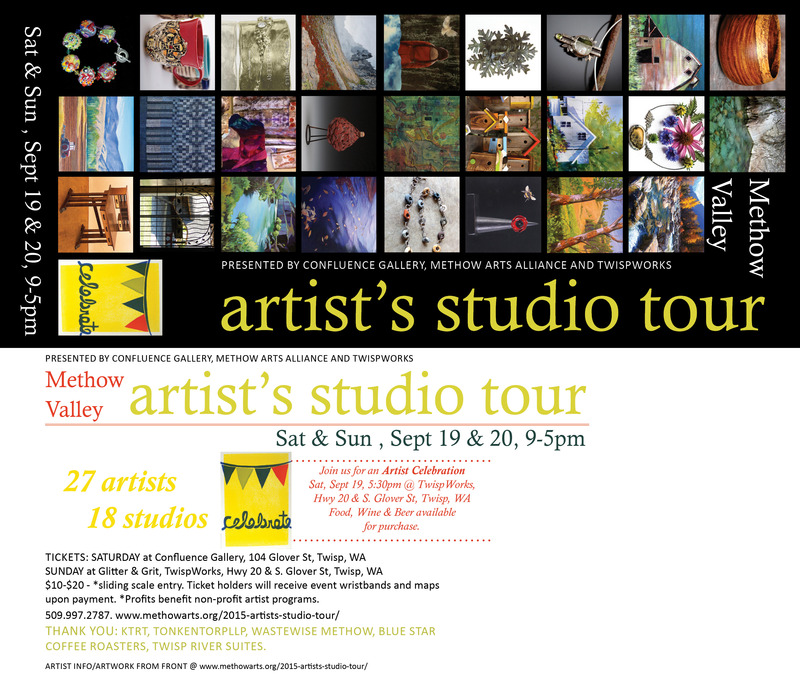 There is a story about it on the Methow Valley News website. Our friend who lives above them lost her access driveway in the ravine and is now cut off, and her outbuilding down on the highway was swept away to the river, but her house is OK. There is more, but these are the ones we are most personally concerned about, and waiting to see how it all turns out.